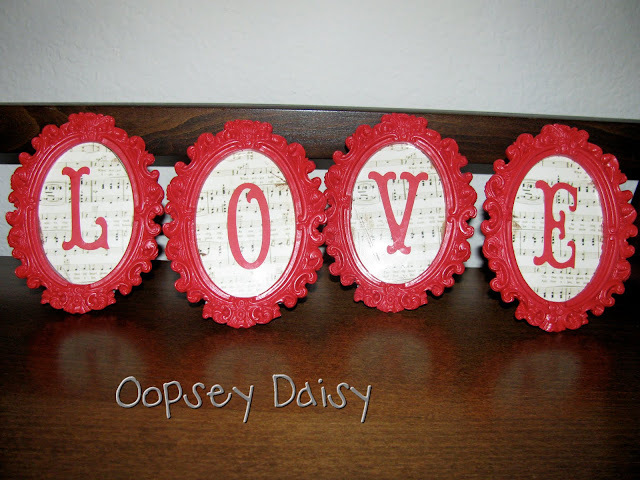 It’s Not Too Late To Decorate for Valentine’s Day! You are here: Home / Valentine's Day / It’s Not Too Late To Decorate for Valentine’s Day! I realize that not everyone loves decorating for Valentine's Day. 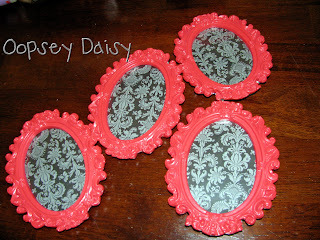 BUT if you want to throw something up just in the nick of time, here are 2 easy ideas to decorate in a flash! 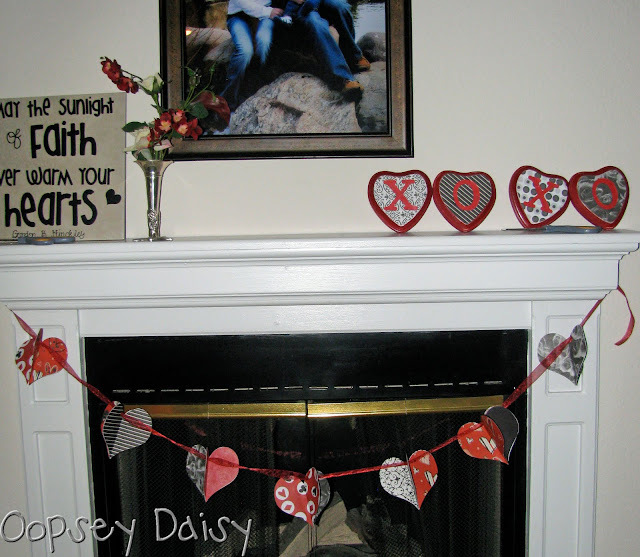 This heart garland would be lots of fun to make with kids. 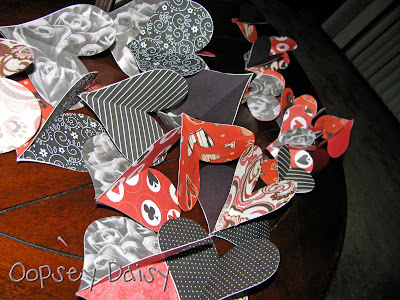 First, cut out a ton of hearts! I am a sucker for red/black/white together, so I scrounged up some scrapbook paper and started cutting. (Well, actually, I let my cricut do all of the cutting. 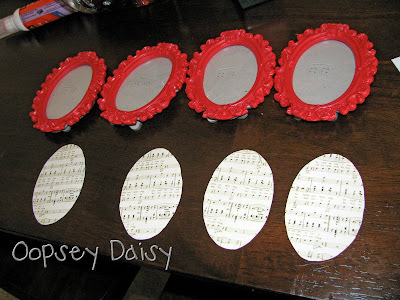 If you cut them by hand, just use a standard template so your hearts are all the same size.) Then fold all of the hearts in half. 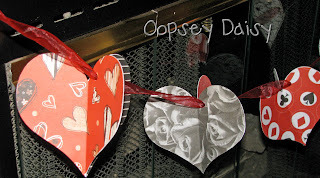 To make the hearts 3-dimensional, I took 3 paper hearts, and glued them together, fold to fold. Then I punched a few holes, and strung them together with red ribbon. Ta-dah! 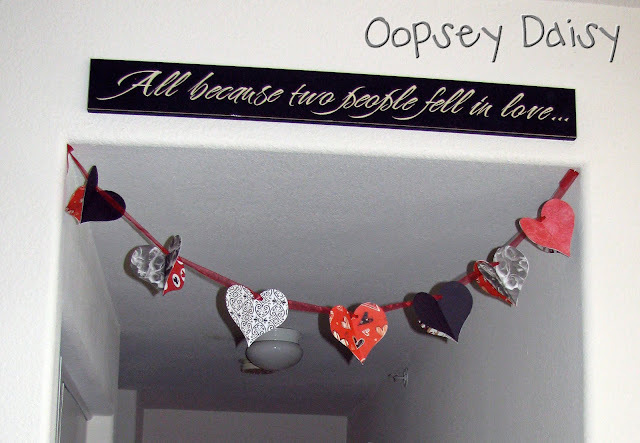 I went a little crazy with the hearts, so I had enough to do 2 heart garlands: One for the mantel and one for the hallway. 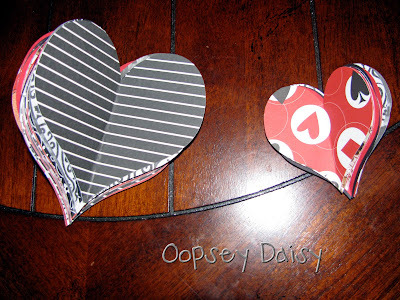 I have a whole set of small hearts, too, that I think I am going to save and use to make a valentine tree next year. My last Valentine's project for the year: I found these cute frames in the dollar bins at Michael's and just couldn't help myself. Then I printed out some vintage sheet music for a song called Moonlight and Roses. Perfect! I traced some ovals to fit in the frames an distressed the edges. I added letters to each frame and added them to a bare bookshelf that needed some sprucing up. Seriously took me about a half hour. So easy. Wow! you creative ones are so inspirational! How cute is that?! Love this! And your colors are perfect! Just featured this!